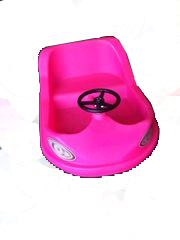 Pink Car Self Propelled. The light weight design makes them very easy to transport and setup. They can hold riders up to 75 pounds. No batteries, motors or peddles to hassle with. Just turn the steering wheel and they go! If you order without an inflatable a $40 non-inflatble fee will be added.